Somebody please tell me what I'm doing wrong here in this code? Import "cordova platform update android -g --save"
Import "cordova plugin add cordova-plugin-admobpro"
Anyone? falsam? Peter? Can you guys please gimme a hand? 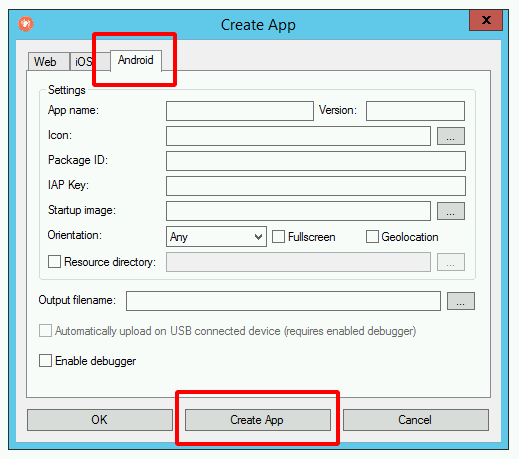 You clicked the button "Create App" in the tab "Android"? that has to be answered by people who have built an app with cordova - plugins before. But I thank you anyway, Peter! P.S. : And I hope you understand me, cause brazilian portuguese is my native language, I'm a very rusty in English! The "iOS message" was a bug and has been corrected in lastest beta. BTW, did you manage to include admobpro in your app ? Fred wrote: The "iOS message" was a bug and has been corrected in lastest beta. BTW, did you manage to include admobpro in your app ? I have yet to successfully build a cordova app including a cordova plugin with any dependency : Falsam and I tried a number of those and always failed. What do you mean "with a dependency" ? You can see plugin dependencies on npm.js for example (ie, a qrscanner plugin with two dependencies). We only tested a few dozen plugins, so it's only circumstantial evidence, but it was our most solid lead.